He was wearing a black beanie and had long, shiny black hair. That’s all I saw through the peephole. Oh, and a flashlight. He was carrying a huge black flashlight. It was a frigid December night, at about 4:30 a.m. I heard my doorbell ringing and desperate repeated knocking. I jumped out of bed and ran to the peephole. That scary-looking guy was trying to tear my door down. I woke my husband and ran with him to the door. “Who are you looking for?” I managed to stutter hoarsely. He was trying to save my family and me from certain death. Then, we both said it together. We managed to laugh tiredly — both of us mothers raising children. I apologized, disconnected my line, and we both slept peacefully for the rest of the night. For ten years I lived around the corner from a matzah bakery in Brooklyn that probably produced the lion’s share of matzos for the neighborhood. And yes, on the icy cold nights and days of December and January, when even some of the best balabustas were not cleaning for Pesach yet, thick plumes of smoke rising out of its chimneys would be seen behind my home. And often, when the wind blew in a particular direction, it could in fact appear to passersby that my house was burning down. My children are practicing for Pesach this week. They are dragging matzos on their shoulders as they dance through a pretend exodus. In this week’s Parashas Bo (12:17) we learn “Ushemartem es hamatzos — and you shall safeguard the matzos.” In this piece we explore what it entails to safeguard matzos, all the way to the fields while the wheat is still growing, and what is going on at matzah bakeries long before you may be thinking about Pesach. From Rosh Chodesh Cheshvan — when all of us are in winter mode — until Pesach, those at many matzah bakeries are busy churning out matzos to satisfy the needs for all of Klal Yisroel. Rabbi Moshe Rabinowitz, who worked in various community matzah bakeries for about ten years, tells of his shifts during the winter: “During the first week of Cheshvan, I mostly worked from 9:00-5:00. But that didn’t last too long. Shifts were extended until seven p.m. and then, right after Chanukah, we had a break at seven and then continued with an evening shift from 7:30-9:30. “Some matzah bakeries opened only two ovens at first and then after Chanukah opened four, and then slowly more, until all the ovens were in use. “Is there anything about the matzah bakery that’s special in the winter — in the beginning, when nobody is dreaming about matzos yet?” I inquire. “Ah, that’s the best part. It was then, when people are not dreaming about matzos, that I actually got to do my work without interference or onlookers. It’s when they started thinking about Pesach that the going got tough,” he says with a smile. But matzah baking doesn’t begin in the bakery. Mrs. Shani Weiss* used to visit the fields with her father, a wheat expert, long before the wheat was cut. And they began their travels each year long before the winter set in. In fact, most of the work on the fields is done in June and July. “The process of creating shmurah matzos begins even before the time of cutting. Once the wheat is fully grown and ready for cutting, it can sprout if it gets too much rain. Naturally, the first thing my father and I checked for in the fields was that the wheat were healthy, not too wet and not too dry,” Shani recalls. In truth, Shani informs me, a wheat expert’s job begins before the previous Pesach. “Let me tell you, I often hear people grumbling about the price of matzos, but what most people don’t know is that the process is so specialized and so drawn out that their money is well spent. It’s simply not possible to produce shmurah matzah at a cheaper rate,” Shani points out. “To illustrate,” she explains, “many steps in the matzah-baking process involve multiple layers, unlike just cutting some apples and oranges. There are foremen, shomrim, and private truckers. You are paying for manpower and involvement. We also need a private mill. You can’t just use a state mill to grind flour for matzah. And when putting wheat in the grain bins at the mill there needs to be a frum person supervising. “Also, generally, farmers don’t work with individual buyers; they work with mammoth companies buying tons of wheat each year. My father and I, and another handful of other wheat experts who work for some other matzah bakeries, are individual buyers who cannot buy such huge quantities as companies can and do. Still, for a good price, they agree to work with us once we have formed a relationship. “And when does the actual cutting take place? Is there a set date?” I ask. “No. We have cut the wheat on Erev Tishah B’Av. We have cut it in 104-degree weather, under clouds, praying for the rain to hold off, and we’ve even cut it on Erev Shabbos. Once, we began the process of cutting on Friday in a beautiful field of healthy and robust wheat, but had to stop at four to get home in time for Shabbos, and that was that. 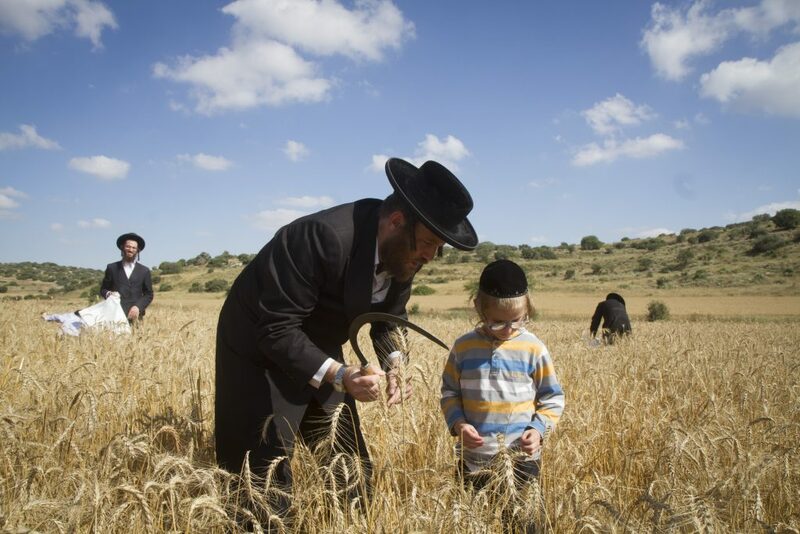 We could not get more wheat from that field, because it had rained on Shabbos,” Shani recalls. “Once the wheat is cut, the load goes from combine to truck. It is then taken to the mill and transferred into grain bins where it stays until around Sukkos time,” she continues. “Older combines will produce wheat that’s not as clean. Wheat cut by those combines needs additional cleaning and drying. Even the grain bins at the mill are not simply bins. They need to be temperature controlled, because the wheat must remain dry and is not allowed to ‘sweat.’ Each matzah bakery will have its own grain bin in the mill. “Working as a wheat expert is an interesting thing for a teenage girl to do in the months of June and July, don’t you think?” I ask Shani. “I was available in the summer and thought, why not help my father? Some children grow up helping their parents in toy stores or fish stores. It was just natural to me. I was available in the summer; it’s something that I just did. “What does one need to become a wheat expert? I heard that you actually became a real maven. What does that mean?” I wonder. “Well, I guess I am crafty and have a good eye,” Shani says. “I can take a sampling of a bag of kernels, spread them out and tell immediately if something is sprouted. In five seconds, I can tell you if a batch is clean. There are people who need to examine kernels for a long time before they know if the batch is good, and some can never tell. Either you get it or you don’t. 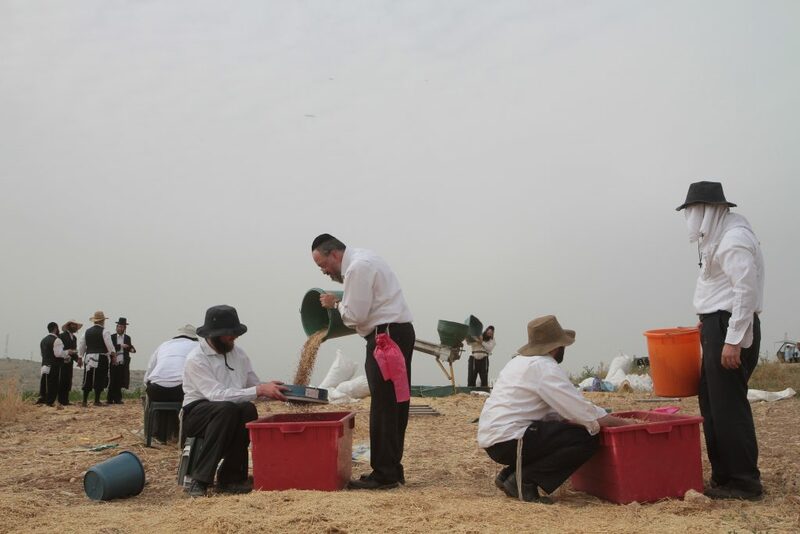 “My father is also very kind and sensitive toward the farmers and taught me a lot about kiddush Hashem — it wasn’t ever only about the wheat,” Shani adds. “He noticed years ago that some farmers were offended by those who spoke in Yiddish. They felt spoken about. My father began translating all the plain talk to the farmers to put them at ease. “I must say that we always witness the tremendous siyatta diShmaya, and the yad Hashem is evident again and again,” Shani relates. “My father and I once had the farmer begin cutting wheat on a beautiful, sunny day. All of a sudden, a cloud appeared and it began to pour. We packed our bags, but we had to pay the farmers a percentage anyway because that is always part of the deal. They won’t negotiate with us knowing that unexpected rain could call off their months of hard work — rightfully so. We lost the field and had to start all over again. After speaking with Shani and Rabbi Rabinowitz, I realize that it is truly a long haul from the field to the box on your table — specialized, upgraded and mehudar. And the thick layer of soot that covered everything in my backyard, and the clouds of heavy smoke coming out of those ovens for months, were powerful evidence of the process that goes on in matzah bakeries around the world, all winter long.